Professor Jackie Bridges’ programme of work focuses on the organisation and delivery of health care to older people with complex needs. She leads a major programme of research focused on professional work and organisational change related to older people’s care, and steers the development and delivery of associated educational provision within Health Sciences. 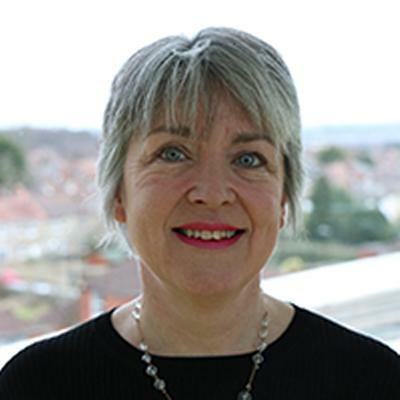 Jackie leads the Ageing and Dementia research theme and is an investigator for NIHR CLAHRC Wessex. She is also Director for the NIHR CLAHRC Wessex Research Capacity in Dementia Care programme. Professor Jackie Bridges’ programme of work focuses on the organisation and delivery of health care to older people with complex needs. She leads a major programme of research focused on professional work and organisational change related to older people’s care, and steers the development and delivery of associated educational provision within Health Sciences. Jackie leads the Ageing and Dementia research group and is an investigator for NIHR CLAHRC Wessex. She is also Director for the NIHR CLAHRC Wessex Research Capacity in Dementia Care programme. How can health care workers can be supported to meet fundamental care needs, especially in older people with complex needs? Developing and evaluating interventions aimed at manipulating these factors. Annabel Rule (2012-) The discharge decision making process for older people returning to the community from a general hospital short stay unit. Supervisors: Jackie Bridges, Jo Adams. Status: ongoing. Paula Libberton (2014-). Relational nursing care for older people in acute hospital settings. Supervisors: Jackie Bridges, Christopher McLean, Carl May. Status: ongoing. Emily Oliver (2014-) The impact of dementia on interactions between staff and patients on acute hospital wards. Supervisors: Jackie Bridges, Ruth Bartlett. Status: ongoing. Lyndsey Rickman (2014-) Multi-sensory stimulation in emergency departments to reduce agitation in people with dementia. Supervisors: Jackie Bridges, Lesley Collier. Status: ongoing. Brian Lucas (2004-2009) Changing experiences of total knee replacement. Structured PhD, City University London. Supervisors: Carol Cox, Lin Perry, Jackie Bridges. Status: PhD awarded. Helen Noble (2005-2009) Opting not to dialyse: a practitioner research study to explore patient experience. PhD study, City University London. Supervisors: Julienne Meyer, Barbara Johnson, Danny Kelly, Jackie Bridges. Status: PhD awarded. This project funded by the Burdett Trust for Nursing extends the feasibility work undertaken in the NIHR-funded CLECC study. This NIHR CLAHRC Wessex study aims to assess the feasibility and acceptability of a combined intervention to increase the delivery of patient-centred multiple fundamental care activities, specifically those related to pressure ulcer prevention. This NIHR funded mixed methods study aims to evaluate the feasibility of an intervention targeted at developing the relational capacity of hospital ward nursing teams. This NIHR funded study uses ethnographic methods to investigate the management of refusal of care in people with dementia admitted to hospital with an acute condition. This Wessex CLAHRC project is a joint project with Örebro University and Karolinska Institute. This explanatory metasynthesis draws on normalization process theory to investigate the dynamics of relational work in hospital settings. This study is funded by the Burdett Trust for Nursing and aims to develop and evaluate opportunities for shared learning, creative reflections, and peer support to support hospital staff to sustain and deliver dignified care. This scoping review identified and synthesised the evidence relevant to the development of dementia nurse specialist roles in acute hospital settings. This action learning and appreciative enquiry study explored how dignity in acute hospital care could be supported and sustained. The work included a meta-ethnography of qualitative studies that reported nurses’ experiences in the nurse-patient relationship in acute settings. The overall aim of this action research study is to implement and evaluate a service improvement programme targeted at enhancing cancer treatment assessment and support for older people in North East London with a new diagnosis of breast or colorectal cancer. This project evaluated the use of discovery interview technique in two NHS trusts in exploring and improving aspects of dignity in inpatient care for older people. Discovery interview technique was used to explore the urgent care experiences of older patients and their relatives from 31 sites across England. A long term study into the effects of Five Element Acupuncture in a primary care setting. A qualitative study to identify nurses’ perceptions of the barriers and facilitators to high quality hospital care for the oldest old. A review of the evidence on strategies to promote quality of life for those living in, working in and visiting care homes. This action research study explored the development of a new support worker role in general medical Inpatient wards, the interprofessonal care coordinator. This study explored the development and impact of senior nursing roles to promote workplace learning in relation to care for older people in acute hospital settings. This study identified a range of factors influencing the quality of care for older rehabilitation inpatients. This project sought to characterise emergency care for older people and the organisational factors influencing its delivery and quality. This study followed up older people placed in NHS funded continuing care following a change in government policy. This study measured the prevalence of pressure ulcers and pressure ulcer risk across a large London NHS Trust. This study examined the role of informal carers in a sociopolitical context. This questionnaire study examined school children’s attitudes to images of nursing. Alexander, S., Bridges, J., Kalsi, T., Melzer, D., Lewis, I., & Seymour, M. (Accepted/In press). Improving outcomes for older people with cancer – a Workshop of the UK National Cancer Research Institute. Journal of Geriatric Oncology. Featherstone, K., Northcott, A., Harden, J., Harrison Dening, K., Tope, R., Bale, S., & Bridges, J. (2019). MemoryCare: Investigating the management of refusal of care in people living with dementia admitted to hospital with an acute condition – an ethnographic study: Refusal and resistance to care by people living with dementia being cared for within acute hospital wards: an ethnographic study . Health Services and Delivery Research. Bridges, J., & Tziggili, M. (2011). Piloting discovery interview technique to explore its utility in improving dignity in acute care for older people. International Practice Development Journal, 1(2), 4. Noble, H., Meyer, J., Bridges, J., Kelly, D., & Johnson, B. (2010). Examining renal patients’ death trajectories without dialysis. End of Life Journal, 4(2), 26-34. Noble, H., Meyer, J., & Bridges, J. (2007). Decision-making for renal patients at the end of life. European Journal of Palliative Care, 14(5), 204-207. Bridges, J., Smith, J., Meyer, J., & Carter, C. (2001). Action research in rehabilitation care for older people. Nursing Times, 97(5), 37-38. Bridges, J., Smith, J., Meyer, J., & Carter, C. (2001). Improving rehabilitation care. Nursing Times, 97(4), 36-37. Bridges, J., Smith, J., Meyer, J., & Carter, C. (2001). Meeting the needs of older people in rehabilitation care. Nursing Times, 97(3), 33-34. Bridges, J., Meyer, J., Smith, J., & Carter, C. (2001). Using action research: an introduction. Nursing Times, 97(2), 30-31. Bridges, J., Meyer, J., McMahon, K., Bentley, J., & Winter, J. (2000). A health visitor for older people in an accident and emergency department. British Journal of Community Nursing, 5(2), 75-80. Bridges, J., Meyer, J., & Barnes, L. (2000). Specialising in older people. Nursing Times, 96(30), 42. Reeves, S., Meyer, J., Glynn, M., & Bridges, J. (1999). Co-ordination of interprofessional health care teams in a general and emergency medicine directorate. Advancing Clinical Nursing, 3, 49-59. Bridges, J., Meyer, J., Davidson, D., Harris, J., & Glynn, M. (1999). Hospital discharge. Smooth passage. Health Service Journal, 109(5659), 24-25. Reeves, S., Meyer, J., Glynn, M., & Bridges, J. (1999). Interprofessional co-ordination of health teams in an acute service: developing a new role. Journal of Interprofessional Care, 13(4), 425-426. Bridges, J., Spilsbury, K., Meyer, J., & Crouch, R. (1999). Older people in A&E: literature review and implications for British policy and practice. Reviews in Clinical Gerontology, 9(2), 127-137. Cotter, A., Salvage, A., Meyer, J., & Bridges, J. (1998). Measuring outcomes of long-term care for older people. Reviews in Clinical Gerontology, 8(3), 257-268. Bridges, J. M., & Lynam, M. J. (1993). Informal carers: a Marxist analysis of social, political, and economic forces underpinning the role. Advances in Nursing Science, 15(3), 33-48. Bridges, J. (1991). Working with doctors. Distinct from medicine. Nursing Times, 87(27), 42-43. Bridges, J. M. (1990). Literature review on the images of the nurse and nursing in the media. Journal of Advanced Nursing, 15(7), 850-854. Bridges, J. (Accepted/In press). Decision-making in complex situations. In S. Reading, & B. Webster (Eds. ), Achieving Competencies for Nursing Practice: a Handbook for Student Nurses Open University. Bridges, J., & National Care Homes Research & Development Forum (2007). Working to help residents maintain identity. In My Home Life: Quality of Life in Care Homes London: Age UK. Bridges, J. (2012). Older people's pilots: North East London Cancer Network. Southampton, GB: University of Southampton. Bridges, J., Meyer, J., & Glynn, M. (2001). An action research study on the co-ordination of interprofessional care: a report for Barts and The London NHS Trust. London, GB: City University. Bridges, J., Meyer, J., Smith, J., & Carter, C. (2000). Using action research to improve rehabilitation care for older people. London, GB: City University. Meyer, J., & Bridges, J. (1998). An action research study into the organisation of care for older people in the A&E department. London, GB: City University. Meyer, J., Cotter, A., Bridges, J., & Salvage, A. (1997). An exploratory study to describe the progress of elderly individuals placed under Band 1 of Lambeth, Southwark and Lewisham Continuing Care Guidelines. London, GB: City University. Bridges, J., & Fuller, A. (2013). Creating Learning Environments for Compassionate Care (CLECC): a programme to promote compassionate care by health and social care teams. University of Southampton. Jackie is Director of the Wessex CLAHRC doctoral training programme in dementia care and is on the programme team for the University’s Alzheimer’s Society Doctoral Training Centre. She contributes to the design and delivery of the MSC programme Complex Care for Older People and is actively involved in promoting research-led teaching in the undergraduate programmes provided by Health Sciences. She also runs the annual "Connecting with Old Age" conference with Age UK Southampton for undergraduate students in nursing, medicine, midwifery, physiotherapy, occupational therapy and podiatry. The aim of the day is to use a variety of interactive and creative methods, in particular service user involvement, to get students thinking about their attitudes to older people and ageing, and the implications for their practice. The learning outcomes are: an insight into the lives of older people, understanding of older people’s experiences of ageing and illness, and an understanding of how to build relationships with older people.